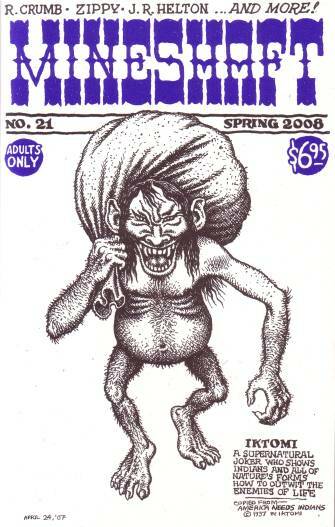 The last great American comics fanzine has another issue out, as fine as the past few: comics by its heavy-hitting line-up of underground greats and quality, underground influenced alternative cartoonists, articles about offbeat art and strange corners of culture, sketches by Crumb, a uniquely formatted dialog between Christoph Mueller and Joe Coleman. It's basically anything anyone with any bit of affection towards those artists and their ethos could want in a tightly-packed attractive magazine, lovely and near handmade. If you're looking for something new in comics, it might be worth picking up this publication to see if something older in sensibility might suffice. These issues are beginning to stand out in bold relief against most of my newer comics. The belle of the ball this time around is a short article heavily illustrated by William Crook Jr., who has provided stunning art to at least one previous issue that I can remember. Crooks seems to be sort of the official artist-historian of Springfield, Illinois. 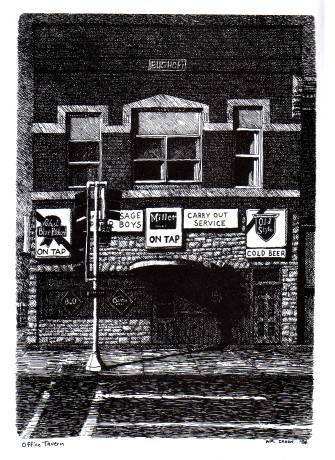 His drawings here are at once beautiful, celebratory and absolutely mournful, Middle America and its architecture caught in a moment of rest and relaxation on its porch, drinking a beer and smoking a cigarette, smiling with cracked teeth. I adored the way they looked and loved Crook's description of older homes "divided up into apartments and then later as they fall into disrepair torn down to make way for parking lots." I would read a whole book of this material, as much as it might break my heart.